Do certain weather conditions scare you? Scared of the weather? Maybe you have a weather phobia! As recently reported in the Washington Times, if you find yourself suffering anxiety or fear from hurricanes, tornadoes or other weather phenomena, you are not alone. In 2006 researches at the University of Iowa surveyed 139 adults. Of those more than half felt panicked by big storms and only a quarter felt no fears at all about the weather. During severe weather season it is not unusual to be quite concerned and touched by a bit of fear when you live in an area that is in danger such as along the Gulf Coast during hurricane season or closer to home here in Colorado when a tornado warning is issued. 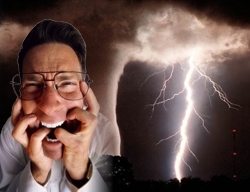 Most anyone would experience anxiety over an approaching storm that threatens to damage life and property. Certainly one can help limit stress about severe weather by being knowledgeable about the type of weather and by extension, remaining calm. Oftentimes fear is caused by the unknown and if you are more aware and learned on the topic, you are more able to deal with the stress. Further, a bit of fear can help you survive a situation simply because you are more in tune and aware of what is going on. This entry was posted on Thursday, October 9th, 2008 at 4:02pm MDT and is filed under Severe Weather, Weather Education. You can follow any responses to this entry through the RSS 2.0 feed. You can skip to the end and leave a response. Pinging is currently not allowed.